Things are growing like crazy in our back yard. It's that time of year again when we have to mow the yard once a week or get buried. Our season went right from abnormally cool to rainy season and warmer than usual for May. That's ok - the butterflies are laying eggs on our Cassia bush, which is also beginning to bloom it's tall yellow stalk flowers. 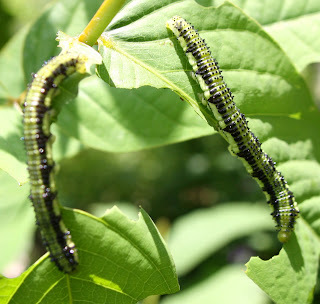 Last year we had no caterpillars on the Cassia. 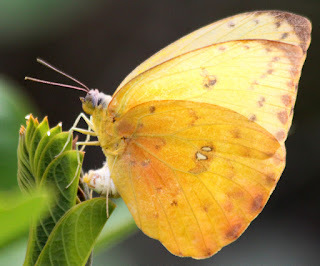 This year, the Cloudless Sulphurs and other yellow butterflies are everywhere and so are their caterpillars. Unfortunately, the Blue Jays seems to like those caterpillars. Monarchs, since they eat milkweed, are poisonous or unpleasant to eat for most predators. I guess Cloudless Sulphur caterpillars taste good. I know some will survive. So here are today's photos. Although I mention the Cassia flowers, I did not specifically photograph them, but I did get some pics of the Cloudless Sulphur caterpillars. As usual, click on the picture to get a bigger, more comprehensive view. Above is a Cloudless Sulphur butterfly laying eggs on tender baby Cassia leaves. Above are the caterpillars that result from the eggs of the Cloudless Sulphur. I read on this web site that if the caterpillar eats the green leaves, it becomes green. If it eats the yellow flowers, it becomes yellow. I'll have to keep my eyes open for yellow caterpillars on the flowers. This is another picture of my tiny friend. My Mimosa is blooming. It was a very small plant last year and it has migrated in a ground cover sort of way. 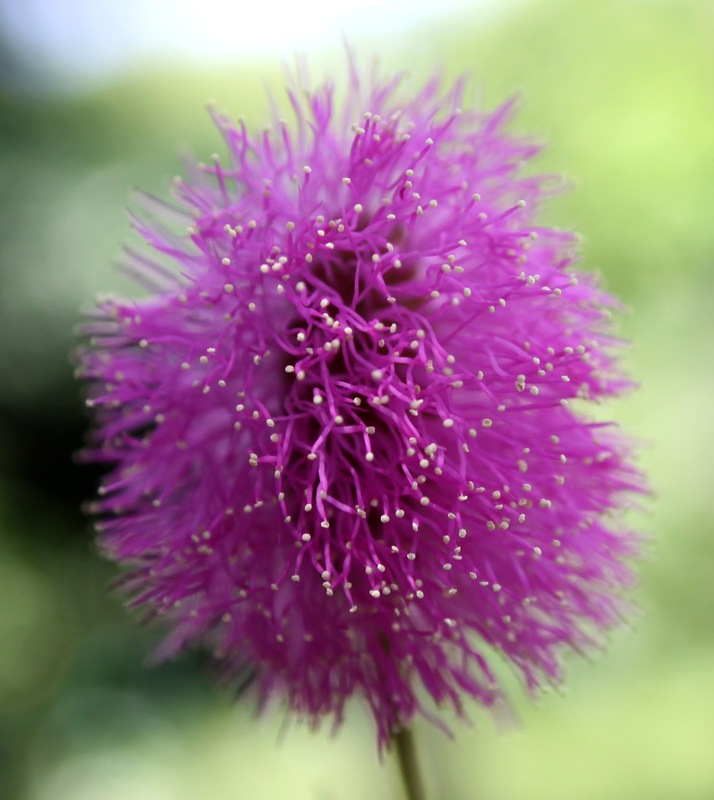 It is very difficult to pick weeds from where the Mimosa is growing because it is all too easy to pick Mimosa instead of weed! I have to be SO careful. The resulting lavender fluffy bloom is beautiful. Above is one small flower. I see lots of buds coming, so there will be more flowers. 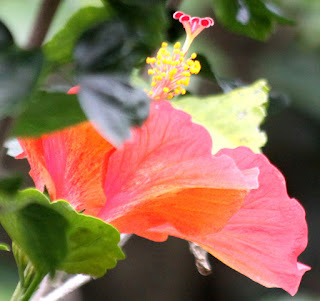 I thought this orangey red Hibiscus looked like it was lit up against the dark green foliage. It is pretty, isn't it? 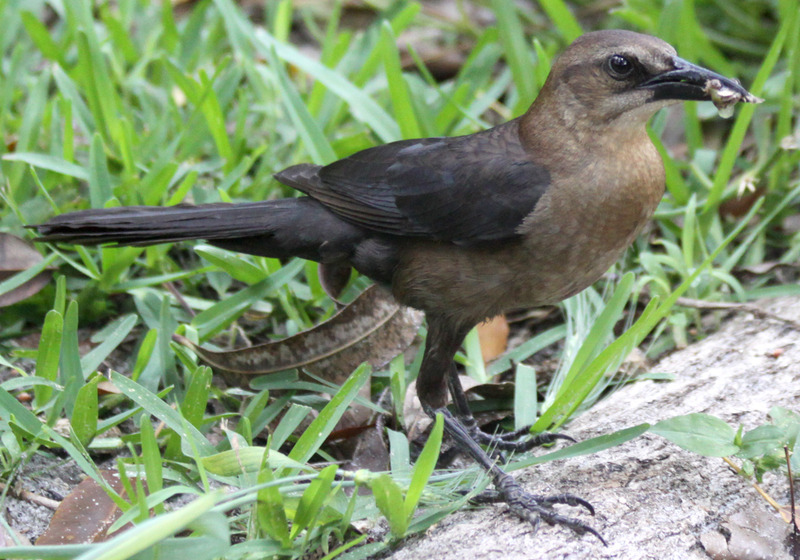 This female Grackle was heading for an unshelled peanut. She already had a dead moth in her beak, but she dropped that for the peanut and then flew off. She evidently prefers peanuts to moths. 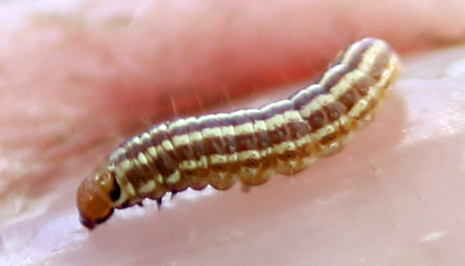 These are Oleander caterpillars. The Oleander moth is beautiful, but I don't have a photo of that today. Can you believe I used to kill these things? What a silly I was. There aren't enough of them to seriously damage the Oleander which I've had for over 5 years and which blooms all the time, so I let them be now. 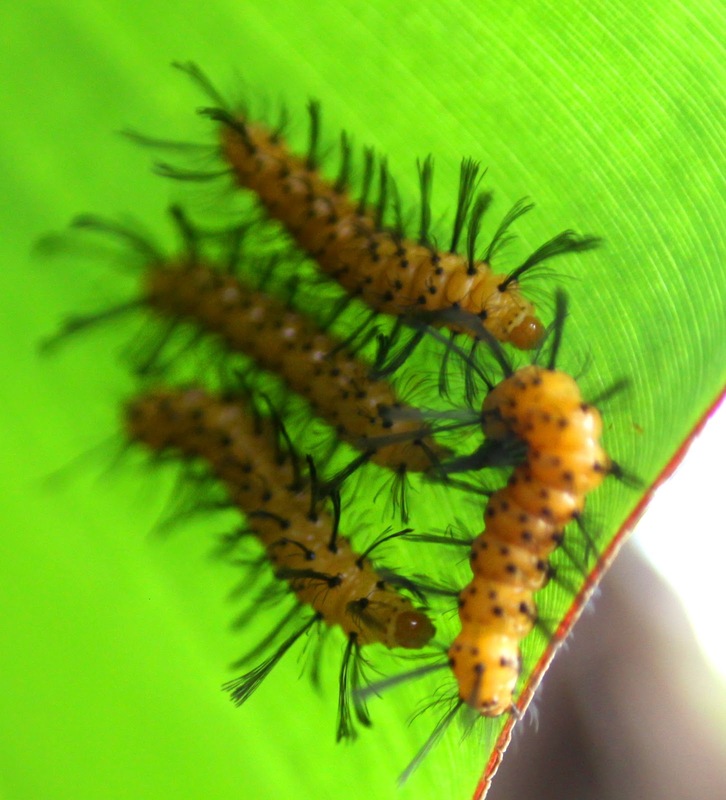 These fellows were on a Banana leaf and they seems to be hanging out (literally) in the underside shade of the leaf. Above is some sort of grain that has grown from bird seed. It is beautiful and it looks a bit like wheat, except wheat is lots longer and yellow or gold in color. Once this begins to fade, I'm cutting and drying it for display in dried arrangements. And last, but not least, my attempt at manual photography. I set my digital camera on full manual and played with the settings, trying to get the purple flower clear, but the water blurred. I'm not sure I succeeded, but I like the picture anyway. I never learned how to make close-up photos. Those are very striking. The colors are so intense, the light so pure. 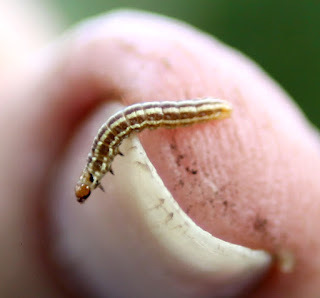 And the caterpillars so cute! Lovely, lovely stuff. I am envious as can be. I have a hard time with landscapes and people, but close ups - they are my favorite. Thank you very much for your compliments. 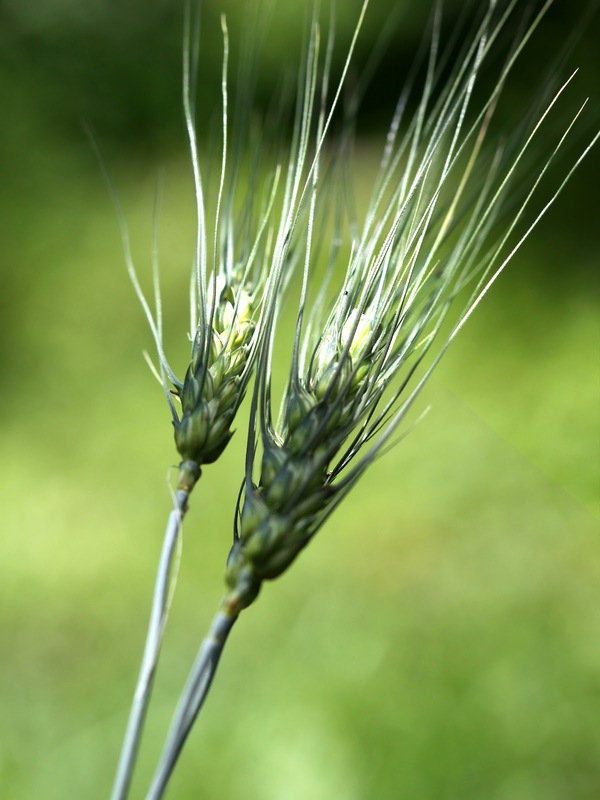 I think the plant that looks like wheat is barley. The best way to photograph people is when they're doing something or when you are just talking to them, when they're talking to others, watch for how the light is falling on them.